(a) Disconnect the 2A and 2C main body ECU (driver side junction block) connectors. (b) Disconnect the 2F main body ECU connector. (c) Measure the voltage and resistance according to the value(s) in the table below. (d) Reconnect the 2A and 2C main body ECU (driver side junction block assembly) connectors. (e) Reconnect the 2F main body ECU (driver side junction block assembly) connector. (f) Check for pulses according to the value(s) in the table below. If the result is not as specified, the main body ECU (driver side junction block assembly) may be malfunctioning. (a) Disconnect the I4 power window regulator motor assembly (for driver side) connector. (c) Reconnect the I4 power window regulator motor assembly (for driver side) connector. If the result is not as specified, the power window regulator motor assembly (for driver side) may be malfunctioning. (a) Disconnect the H4 power window regulator motor assembly (for front passenger side) connector. (c) Reconnect the H4 power window regulator motor assembly (for front passenger side) connector. If the result is not as specified, the power window regulator motor assembly (for front passenger side) may be malfunctioning. (a) Disconnect the J2 power window regulator motor assembly (for rear RH side) connector. (c) Reconnect the J2 power window regulator motor assembly (for rear RH side) connector. If the result is not as specified, the power window regulator motor assembly (for rear RH side) may be malfunctioning. (a) Disconnect the K2 power window regulator motor assembly (for rear LH side) connector. (c) Reconnect the K2 power window regulator motor assembly (for rear LH side) connector. If the result is not as specified, the power window regulator motor assembly (for rear LH side) may be malfunctioning. 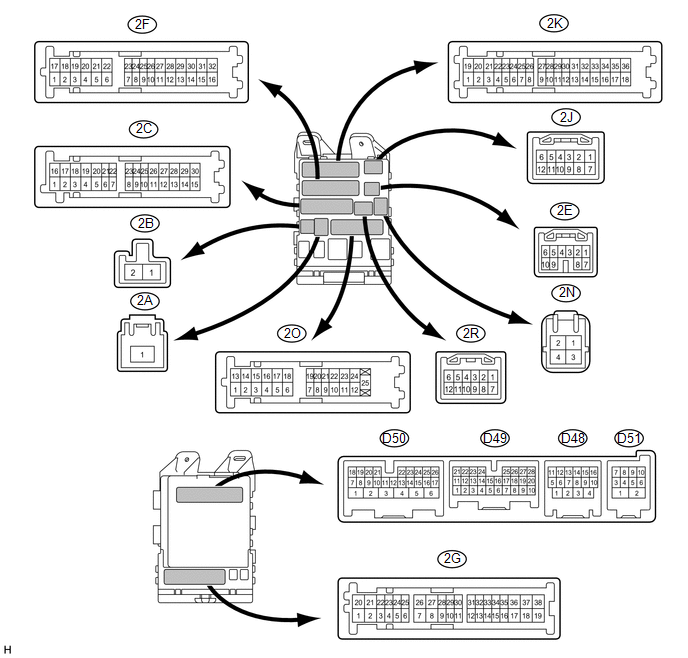 (a) Disconnect the I6 multiplex network master switch assembly connector. (c) Reconnect the I6 multiplex network master switch assembly connector. If the result is not as specified, the multiplex network master switch assembly may be malfunctioning. (a) Disconnect the P4 sliding roof ECU (sliding roof drive gear assembly) connector. (c) Reconnect the P4 sliding roof ECU (sliding roof drive gear assembly) connector. If the result is not as specified, the sliding roof ECU (sliding roof drive gear assembly) may be malfunctioning. (a) Disconnect the D25 certification ECU (smart key ECU assembly) connector. (c) Reconnect the D25 certification ECU (smart key ECU assembly) connector. If the result is not as specified, the certification ECU (smart key ECU assembly) may be malfunctioning. (a) Disconnect the D43 power management control ECU connector. (c) Reconnect the D43 power management control ECU connector. If the result is not as specified, the power management control ECU connector. (a) Disconnect the D17 steering lock ECU (steering lock actuator assembly) connector. (c) Reconnect the D17 steering lock ECU (steering lock actuator assembly) connector. If the result is not as specified, the steering lock ECU (steering lock actuator assembly) may be malfunctioning.